Digital media dominates the profession of illustration and design today; it's quick, it's affordable and with the right skills there's very little that can't be done to order. You could be forgiven for thinking, then, that the art of wood engraving would be a thing of the past, sequestered to the plates of dusty old fairy tales in second hand bookshops - but thankfully, that's not the case. I spoke to master engraver and wood block maker Chris Daunt to find out about this incredibly skilled craft, where woodwork and artistry meet. 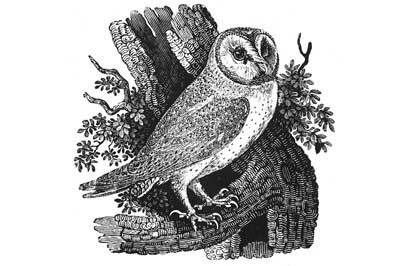 Born as an art form towards the end of the 18th century, wood engraving is an extremely intricate relief printmaking technique, perhaps most widely known in the form of book illustrations by artists such as Thomas Bewick, Gustave DorÃ© and Eric Ravilious. is transferred from within the incisions. 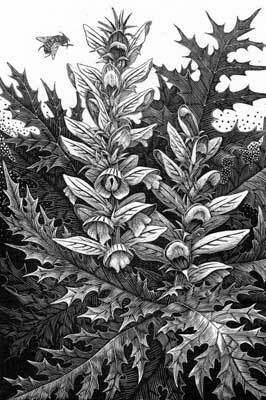 Upon completing a degree in Fine Art in the late 1970s, Chris Daunt took some tuition from wood engraver Leo Wyatt, but it was several years before he took up engraving seriously. He took a somewhat roundabout route, becoming a Cistercian monk in the Scottish Borders for four years, before completing another degree, this time in English Literature, and then teaching English for a year in Poland. "It was all quite a complicated start... but that's another story!" 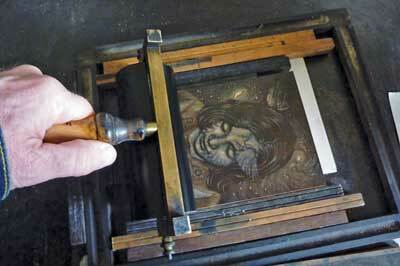 He goes on; "I became an illustrator, principally in wood engraving, woodcut and linocut. My first wood engraving work included making things like the artwork for sausage packaging and wine labels, in fact, there are still sausages in supermarkets with my wood engravings on their packets!" Wood engraving as a medium in advertising, he explains, is generally used as a way to convey a sense of tradition; "If a company wants to put across an image of authenticity, or a sort of earthy, wholesome feel, wood engravings have that quality, which is why you still often see them on things like wine and whiskey labels, or various organic products. The handmade art form suggests the same of the product." However, the scope of his illustrative work does not stop there; "At the less commercial end of things, I've made illustrations for the Folio Society, private press publications, newspapers and magazines." 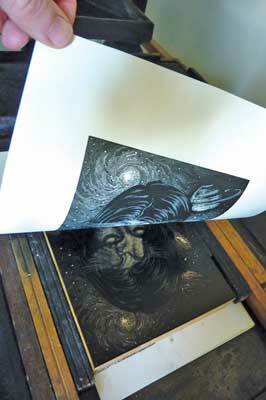 His book illustrations include Folio Society editions of works by Philip Pullman, Vita Sackville-West and Jean Rhys. When I asked Chris about his influences, old and new, there was only one place to start; "Thomas Bewick is really regarded as the father of wood engraving; he didn't invent it, but he made it into an art form during the late 18th and 19th century. He also has a special significance to me, as he was born and worked close to where I come from and live and work now, just across the Tyne." 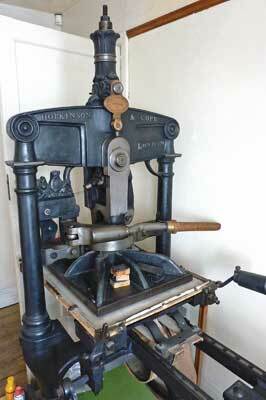 In 2003, the last remaining producer of wood engraving blocks in the country, T.N. Lawrence, announced suddenly that they were to cease producing blocks, threatening the continuation of the art form as a whole. 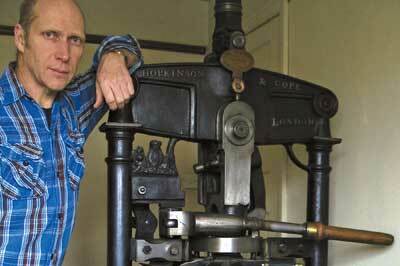 As a member of the Society of Wood Engravers and having been making his own blocks for several years, the Society approached Chris with an offer to fund him for equipment and supply a bursary to give him some time to perfect his methods, so that he could replace the country's sole commercial producer of wood engraving blocks. It wasn't a difficult offer for Chris to accept; "The block making business was a great way for me to get out of the commercial side of engraving and just concentrate on the art. Now my day job is making blocks, and I'm freed up to make engravings of my own choice. At the moment I'm working on a series of portraits of my daughter, which I once would have struggled to find the time to do." 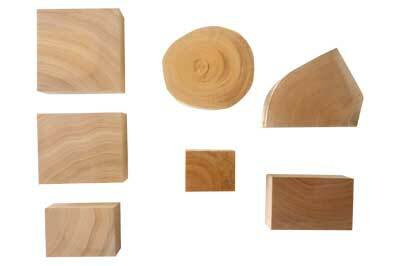 The blocks are generally made from boxwood (Buxus sempervirens) or lemonwood (Calycophyllum candidissimum). 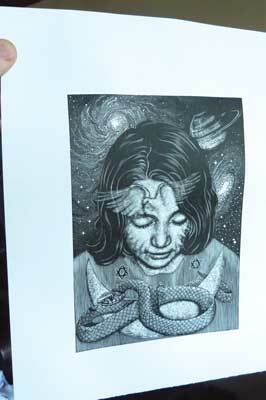 Engravers always work with the end grain, as it has no directional properties - as opposed to the woodcut style, which incorporates the side grain. 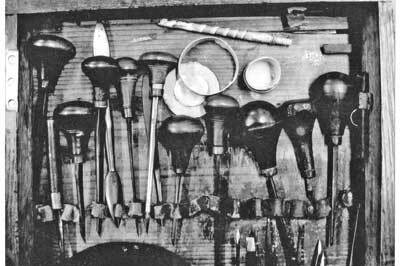 "What you want from the surface is for it to be anonymous, so the properties of boxwood make it the perfect medium for engravers. There is no visible difference between the heartwood and the sapwood - it's completely even. It is an extremely dense wood, but doesn't have the brittleness you find with tropical hardwoods, so it cuts beautifully - the fibres are close enough to hold up to exceptionally fine detail and cross-hatching." The other useful property of boxwood is its high level of durability; "Today, the usual run of prints will be around 75, up to a maximum of about 250. But for Gustave DorÃ©'s illustrations the same block would have been used for thousands of impressions, and for one of Bewick's newspaper mastheads the amount was close to a million." While box is the wood of choice for extremely fine work, lemonwood is a useful, and less costly, substitute; "It isn't as dense as boxwood, but it is much easier to cut large areas from and faster to work on in general. Much engraving work doesn't require the extreme density of boxwood, and lemonwood is still dense enough that you can work to a very fine detail - it takes a lot of practice before you can create detail finer than is possible on lemonwood. About 75% of blocks I sell are lemonwood." 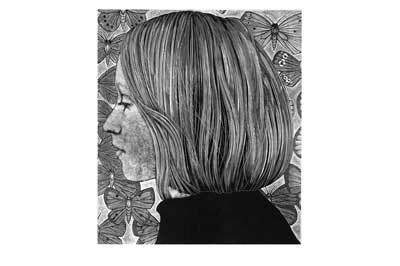 Founded in 1920 by a group of artists including Eric Gill and Robert Gibbings, the Society of Wood Engravers exists to promote the art form, acting as a platform for exhibiting work and a communication tool for engravers and indeed anybody with an interest in the subject. An annual touring exhibition is run by the Society across the UK, and the SWE even arrange events overseas. 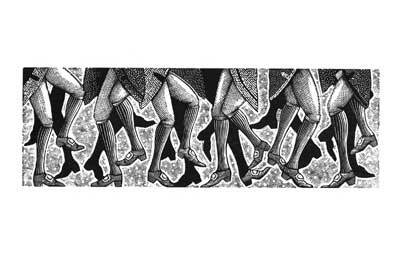 "The Society of Wood Engravers has been hugely important for me, as it is for wood engraving as a whole." Chris says, "They helped me to set up my block making business, which again not only helped me but the whole art form, by making sure that the specialist blocks remained available." Chris also edits the SWE's quarterly journal, Multiples, which has a circulation of around 500: "Editing the journal keeps me in touch with what other engravers are doing, too, which is very useful." A man in a unique, central position in the world of wood engraving - the UK's only commercial producer of blocks, an experienced and skilled artist and the Editor of the Society's journal - there seemed no better person to ask the question: What is the future of wood engraving? 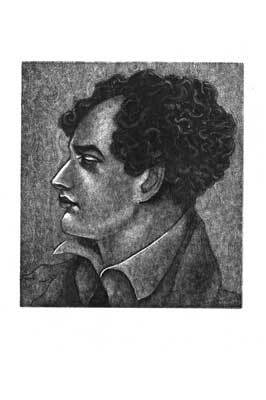 "As far as the commercial side of engraving is concerned, illustration is a very competitive industry and I suspect there can only be a handful of engravers who do it commercially - it goes in and out of fashion, and you are at the mercy of advertising trends and creative directors and so on. 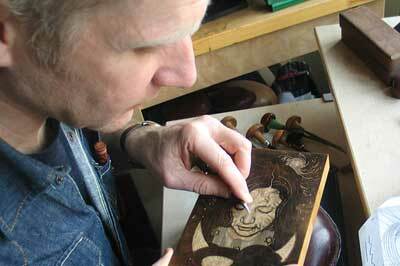 But people do make a living by combining their wood engraving practice with teaching. I teach up and down the country myself, and attendance is never a problem. It's unfortunate that art schools teach traditional printmaking techniques less and less, but this reflects an industry that is very digitally orientated and traditional printmaking is now a niche interest, so you have to seek private courses at places like independent print studios." But despite less ready access to tuition, there is no shortage of people practising engraving. 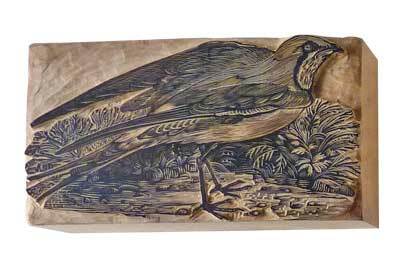 While as a commercial art form it can be impractical, as a fine art medium, wood engraving is evidently flourishing; "The amount of work submitted to the Society of Wood Engravers has increased dramatically. And as a craft, I have no doubt it will carry on and on, because the process itself is such a pleasure - there's nothing like pushing an engraving tool through wood, the feel, the sound, the smell, working with linseed oil-based inks; it's a very special hands-on process which can't be matched."